Hahn Park’s Community Trail is quite well named. 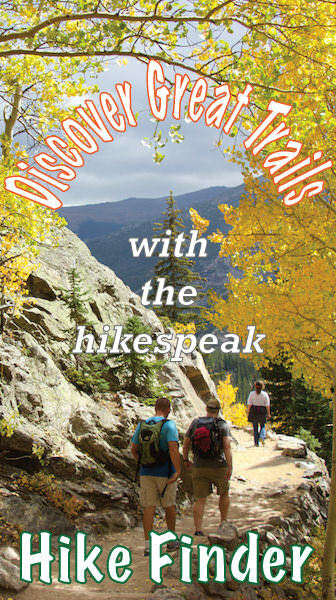 It isn’t the type of hike you would travel a long distance to visit, but if you live nearby, you are lucky to have it. 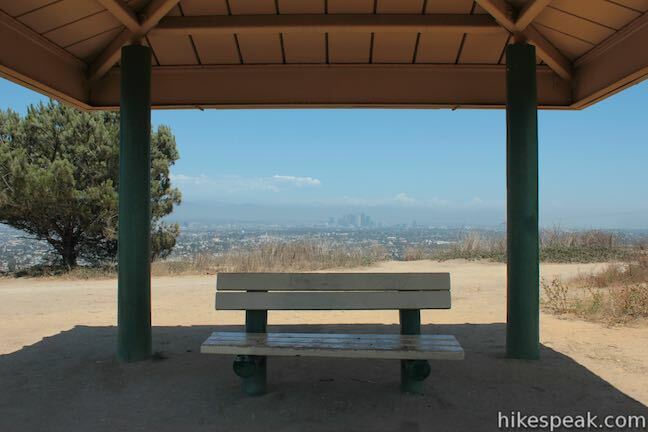 The highlight of this 2.5-mile hike in the Baldwin Hills is a string of ridge-top viewpoints that looks north over Los Angeles. 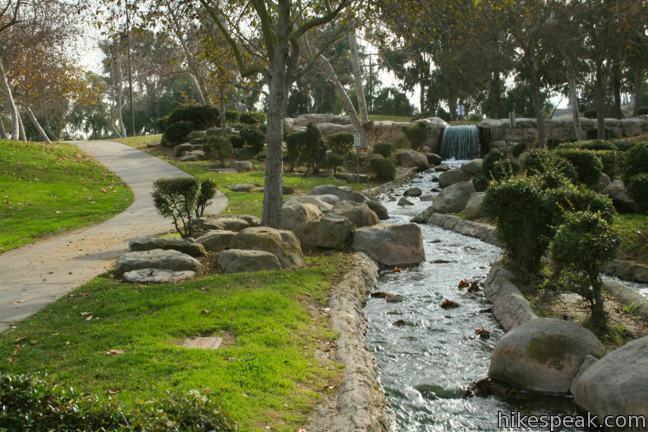 The 319-acre park is bordered by oil fields that limit the natural charm. 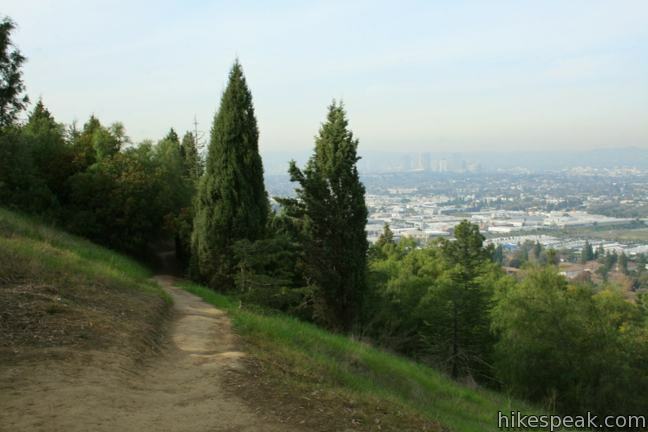 Otherwise, this is a pleasant city hike with 75 to 200 feet of elevation gain, depending on your route. 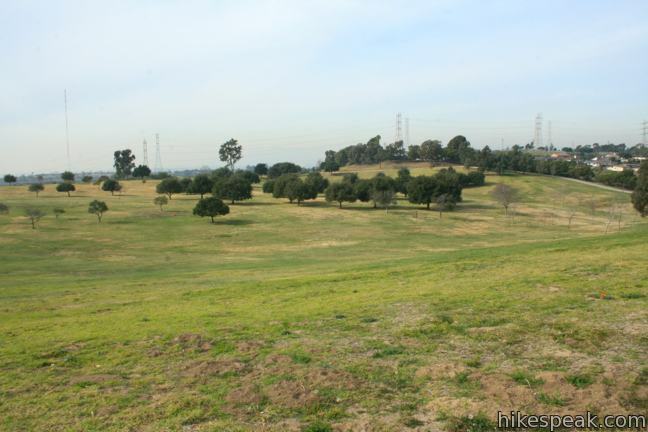 From La Cienega Boulevard, drive southeast through Hahn Park to Janice’s Green Valley, a large bowl-shaped field. 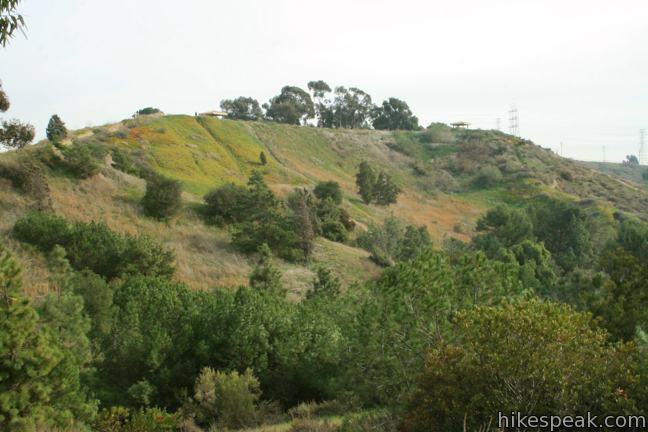 Begin hiking counterclockwise around the circular depression, which is the filled-in remains of Baldwin Hills Reservoir. The lining of the reservoir cracked in 1963, flooding houses in the city below, killing five. Stress from nearby oil drilling is thought to have caused the weakness in the reservoir wall. After the flood, the reservoir was covered to create the large field (which visitors are not allowed to use for any sports activities). After 0.6 miles, reach the northwest end of the field, opposite from where the hike began. Angle to the right on a dirt trail heading north along a ridge that overlooks the developed areas of Kenneth Hahn State Recreation Area. Look west over the playground, picnic area, and fishing pond below, or beyond the park toward a bleak hillside of churning oil derricks. 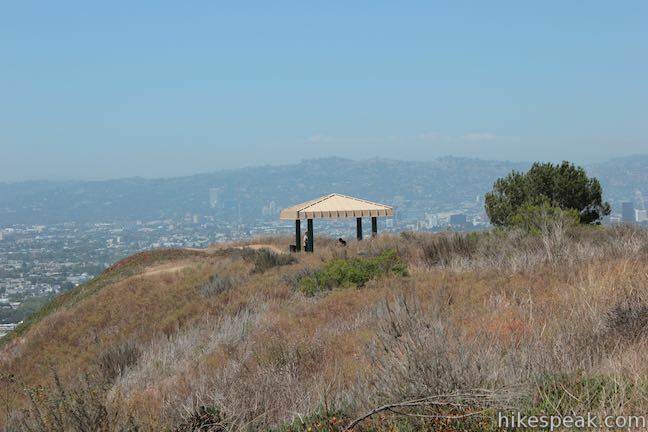 The trail follows the top of the ridge toward pavilions placed at good viewpoints. 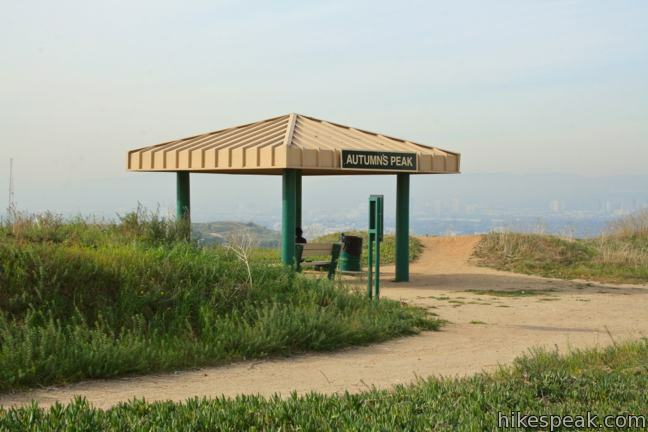 Just under a mile from the start, you will pass through a eucalyptus grove to find the first two shelters, Michael and Emilia’s Viewpoint and Autumn’s Peak, both positioned to look west across the park. 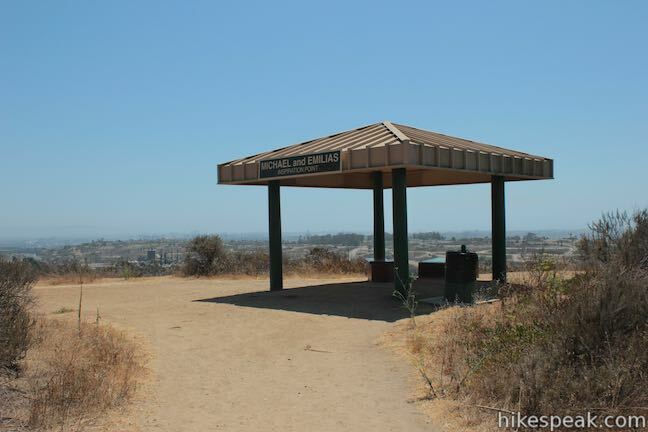 On the right side of the trail opposite Autumn’s Peak Pavilion, you will find the top of City View Trail, a path that drapes down the northeast side of the ridge before reuniting with the main trail at a saddle 1/8 of a mile down the ridge. 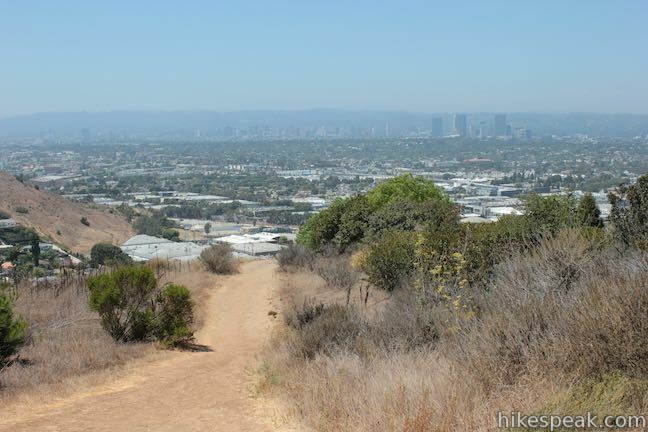 City View Trail takes 0.17 miles to reach the same saddle and offers additional views to the northeast toward downtown Los Angeles. 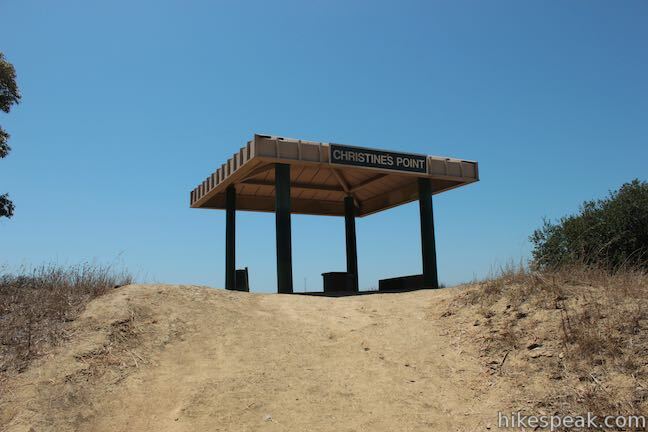 It is a short hike down the ridge to the third pavilion, Christine’s Point, located about 200 feet past the saddle. 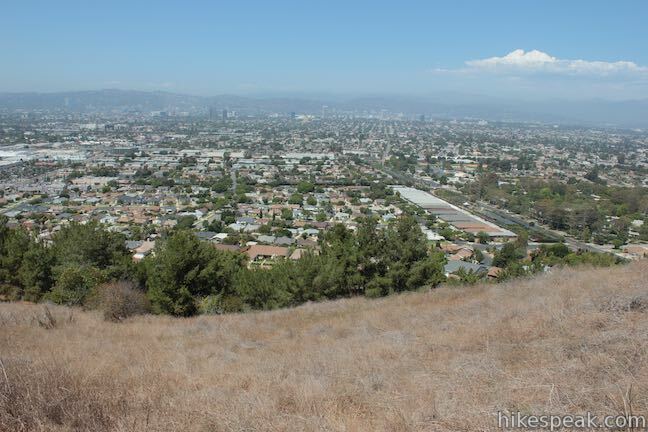 The end of the ridge delivers the best view over Los Angeles toward the Hollywood Hills. Griffith Park landmarks like the Hollywood Sign and the Griffith Observatory are visible to the northeast, and downtown LA rises above the sprawl to the east. 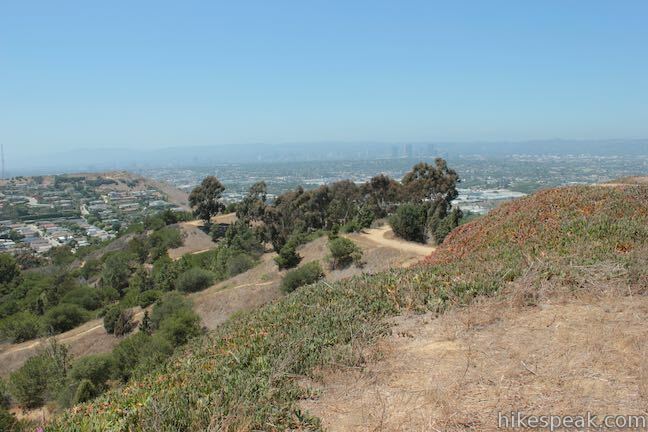 Christine’s Point is the northwest corner of the hike, and has a unique view over the corridor occupied by La Cienega Boulevard dropping into the city below. To return, you can circle around to the saddle and head back the way you came, repeating the 1.3-mile trail with 75 feet of elevation gain. 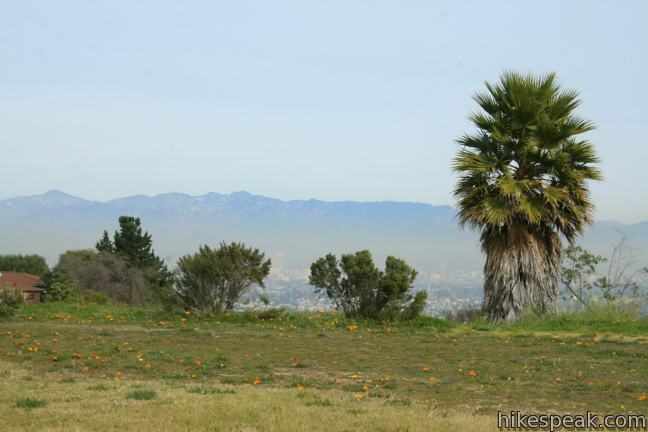 You can also take the wide dirt trail heading south from the saddle near Christine’s Point, which heads downhill toward the developed lowlands of Kenneth Hahn State Recreation Area. This route will allow you to circle back to the start on a slightly shorter hike with more elevation change. On the north side of the saddle there are two other trails, the lower end of City View Trail and another track that descends a quarter mile to an artificial waterfall at the northwest corner of the park. 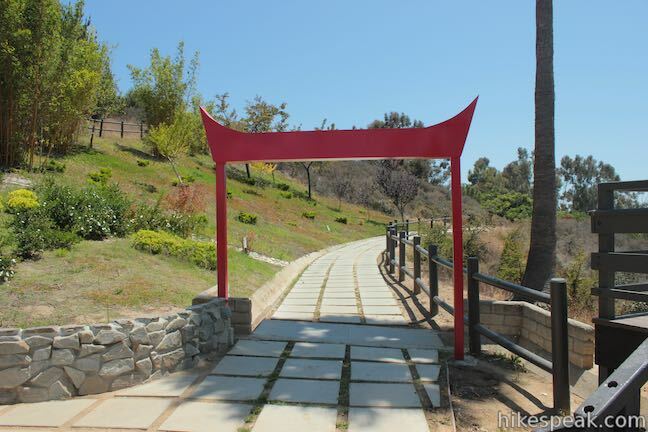 From there, a wide walkway leads to impressive Japanese Gardens at the end of a long parking area. 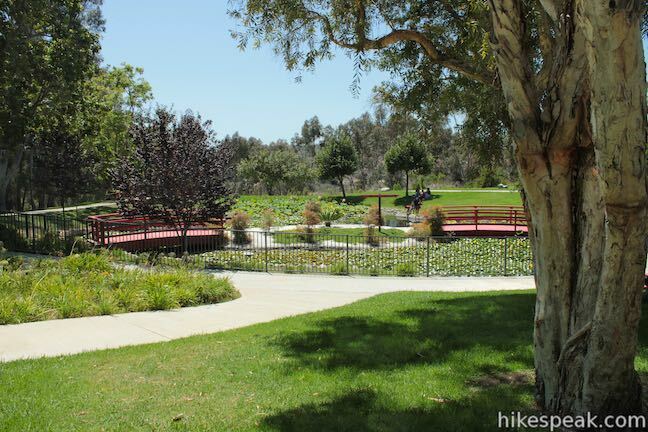 For the 2.5-mile loop hike, take the dirt trail south for 0.2 miles to a parking area along the main park road (there is a jump-filled track running parallel to the trail for bikers). From the bottom of this trail, there are no more trails to follow, just a few sidewalks to follow on a choose-your-own-adventure back to the trailhead. Turn left and make your way across the road past the park entrance gate up to Gwen Moore Lake, a small man-made fishing pond. 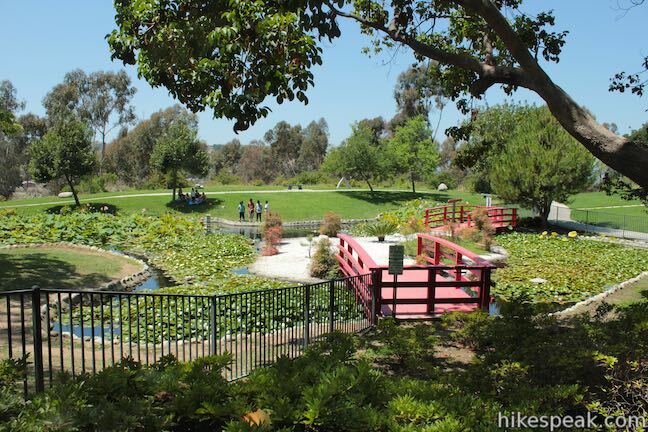 Walk around the popular fishing spot and head up the walkway bordering a charming but artificial creek that flows into the lake. Japanese bridges add serenity to the quarter-mile stroll. Oil derricks just beyond the trees on the opposite side of the creek do not. 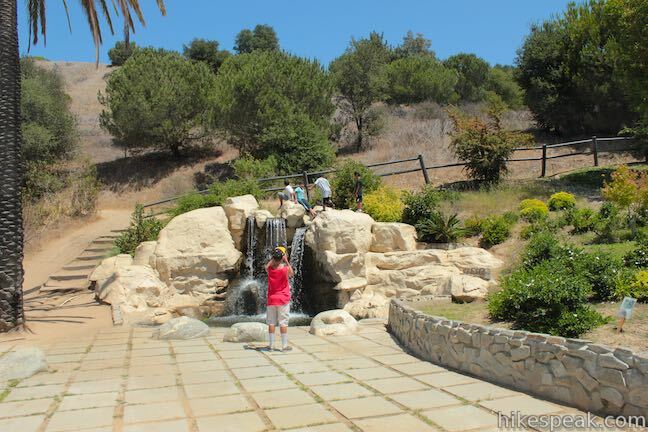 Pass the fountain at the top of the creek, continue up to the park community center and cross to the left side of the road. 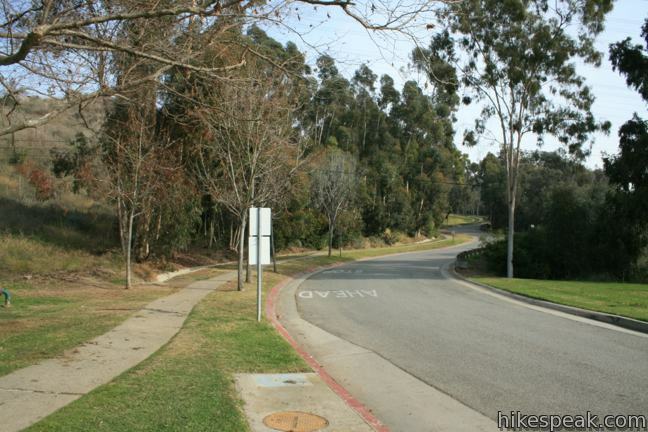 Take the sidewalk up the hill to return to your vehicle at Janice’s Green Valley. 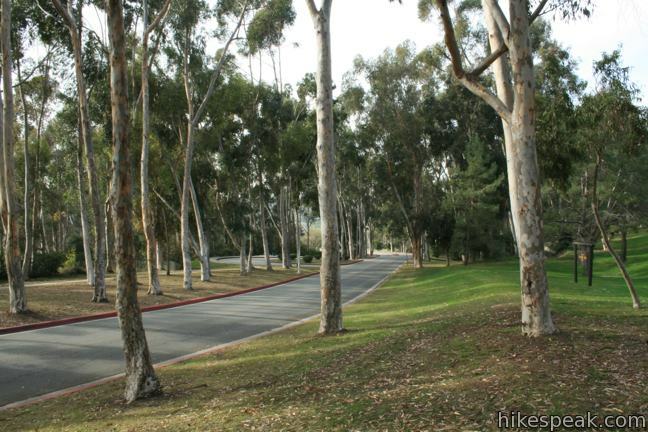 On weekends and holidays, there is a $6 vehicle fee to enter Kenneth Hahn State Recreation Area. On other days, the park is free. No permit is required and dogs are welcome, so get out and enjoy! 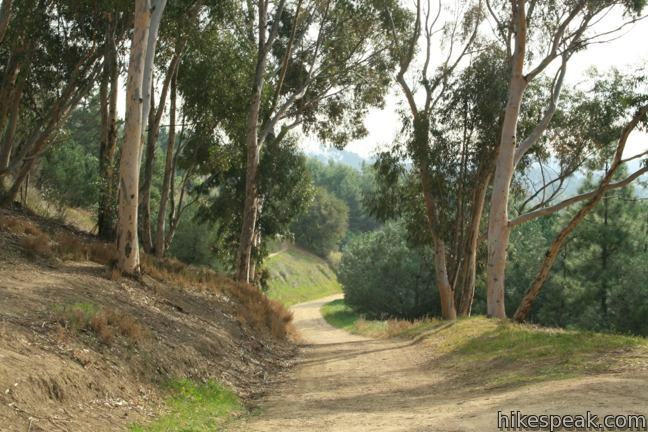 To get to the trailhead: From the La Cienega exit of the 10 Freeway, drive 1 3/4 miles south on La Cienega Boulevard to the off-ramp for Kenneth Hahn State Recreation Area. 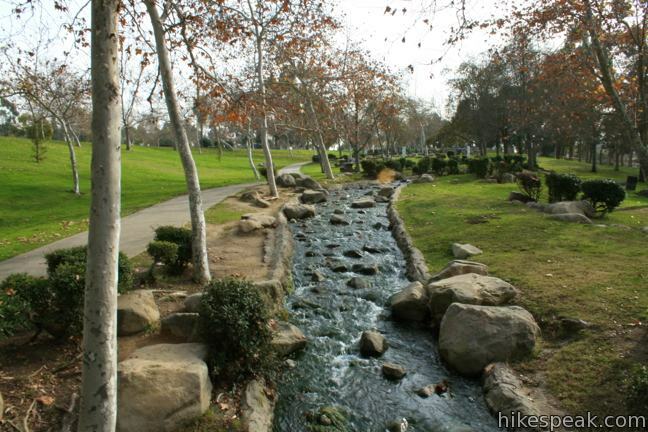 At the top of the ramp, turn east, cross over La Cienega and enter the park. Pass through the gate and proceed one mile through the park and up a hill to the trailhead (the bottom part of the loop hike parallels this road). At the end of the road, there is parking on the left and right in front of a playground and bathrooms. Backtrack down the sidewalk a hundred feet to find Janice’s Green Valley on the north side of the road. 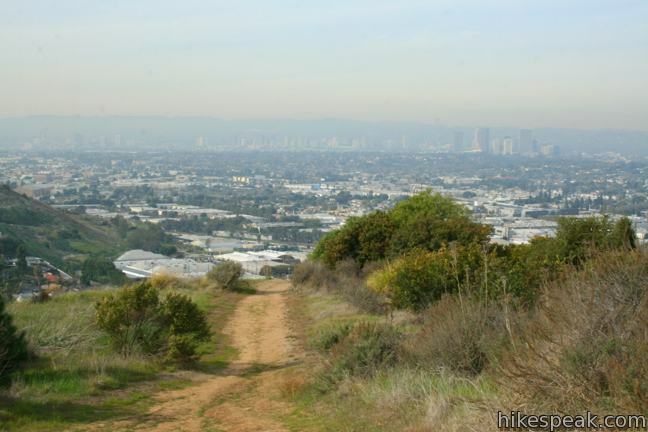 You may also view a regional map of surrounding Los Angeles trails and campgrounds. These photos were taken in January of 2012 and August of 2013. Click to enlarge. 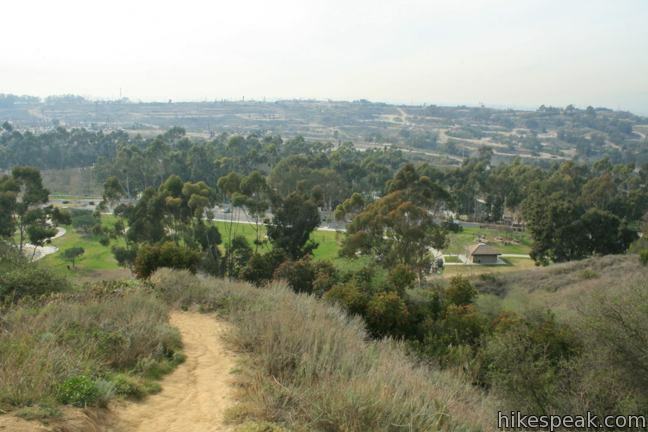 This 2.5-mile hike ascends a grassy slope south of Culver City, crossing a steep staircase to an expansive viewpoint overlooking the Los Angeles Basin. 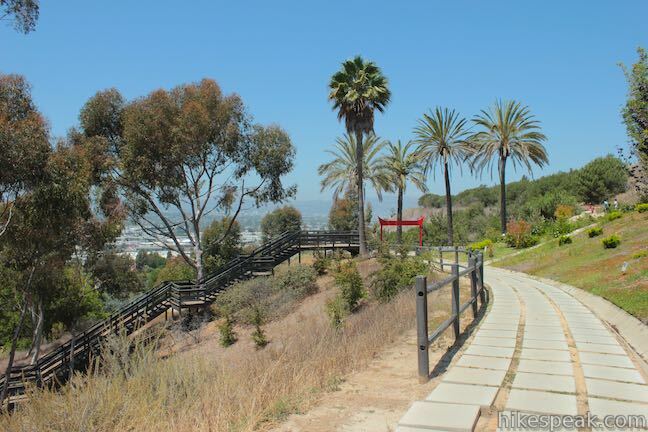 This easy hike of up to 4.7 miles round trip follows the Westchester Bluffs west below the campus of Loyola Marymount University. 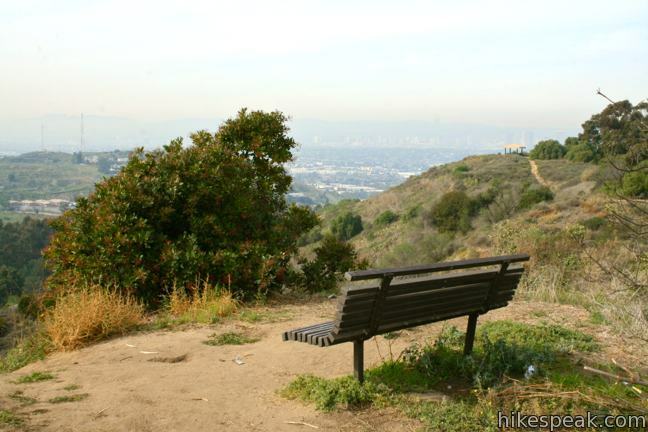 Tour Hollywood's most popular dog park on loops of various lengths, offering good exercise and views over Los Angeles. 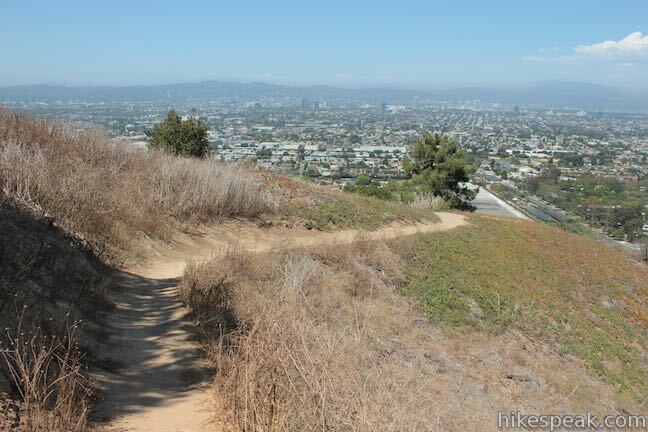 This 2.5-mile hike incorporated Bantam Trail and Castair Trail in a park adjacent to Runyon Canyon. 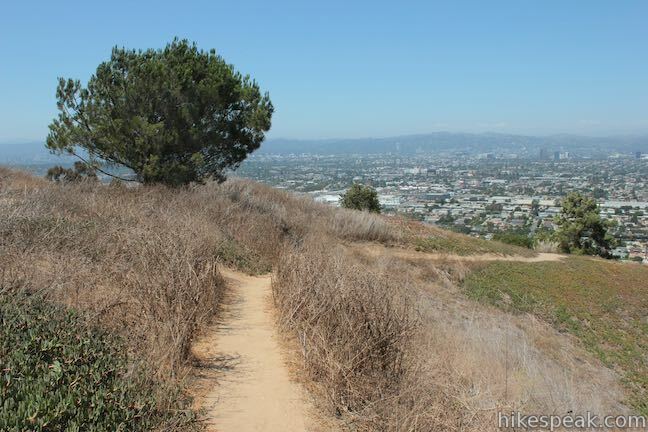 Explore other destinations in the Santa Monica Mountains, San Gabriel Mountains, and elsewhere. How long is the hike that is pictured on the map? 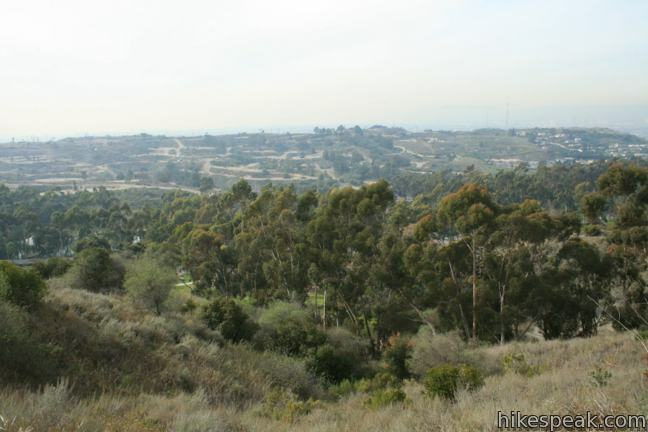 Is it possible to hike 6-8 miles w.o just going around in circles? The loop shown is 2.5 miles long. If you add the adjacent La Brea Loop Trail (shown on this park map) you might be able to get close to 6 miles. Enjoy your hike! 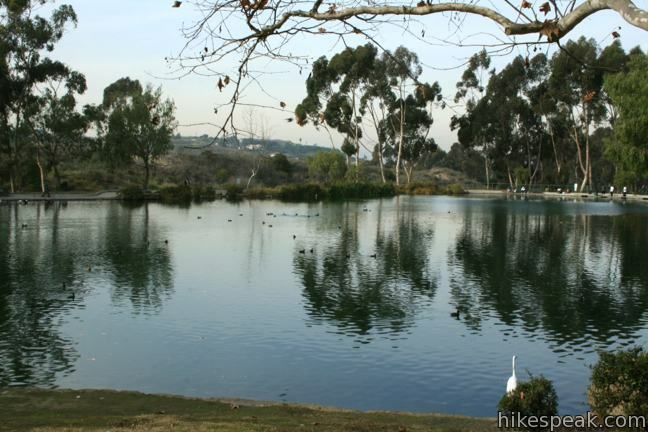 I need directions to the Baldwin Hills Dam Reservoir for the 50th Anniversary. Thanks. 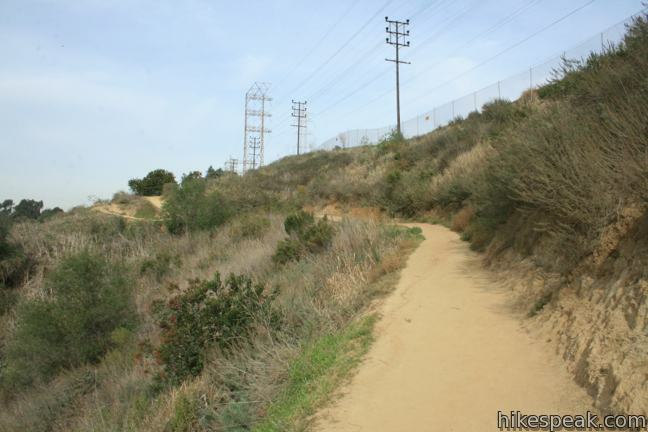 Access by foot or bicycle requires travel on La Brea or La Cienega which are both like freeways without sidewalks. 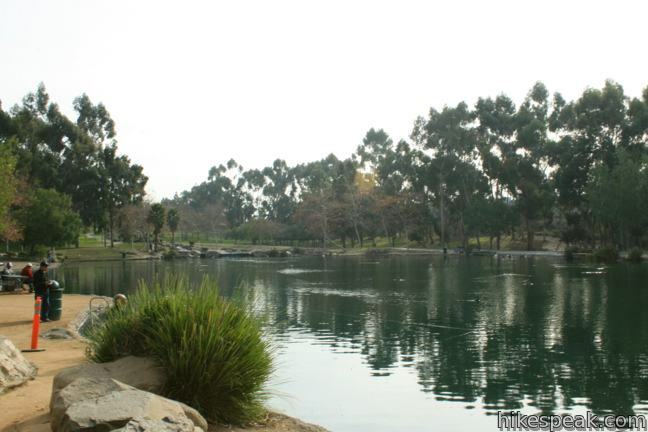 Free parking during the week, $6 (I think) on weekends, but there is a free or cheap shuttle from the La Cienega Metro station to Hahn Park from 8 am until 6 pm on weekends and holidays. Oh! Even more important, Google Maps, Siri, etc. 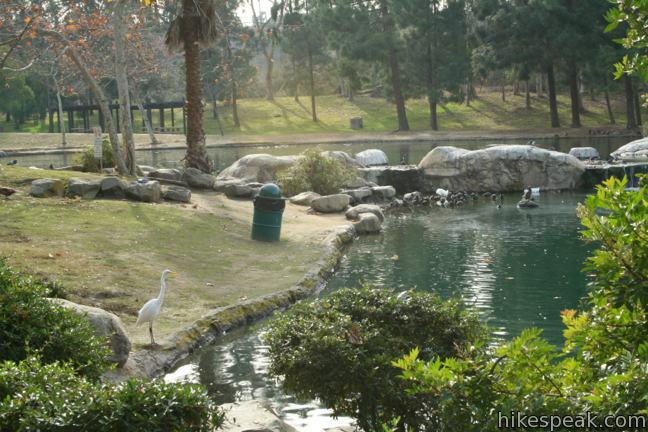 will tell you that you can hike through the nice neighborhoods to the north to get into the park. You can’t, the fences and security cameras will stop you. You can only enter from La Brea or La Cienega. 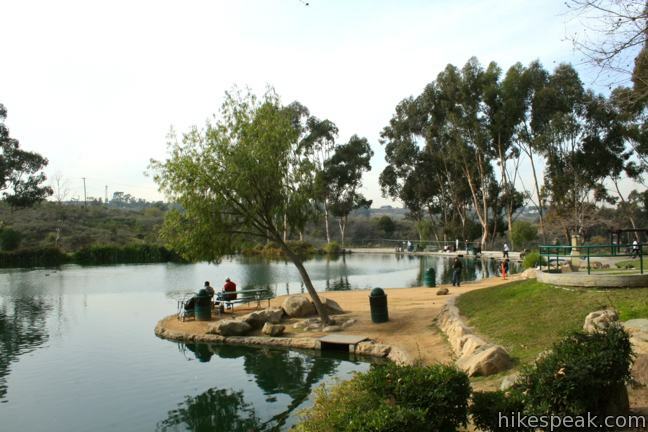 You’ll need to reach out to Kenneth Hahn State Recreation Area at 323-298-3660. Would you consider Diane’s Trail stroller friendly? I have an all-terrain stroller that maneuvers nicely and has front wheel suspension. 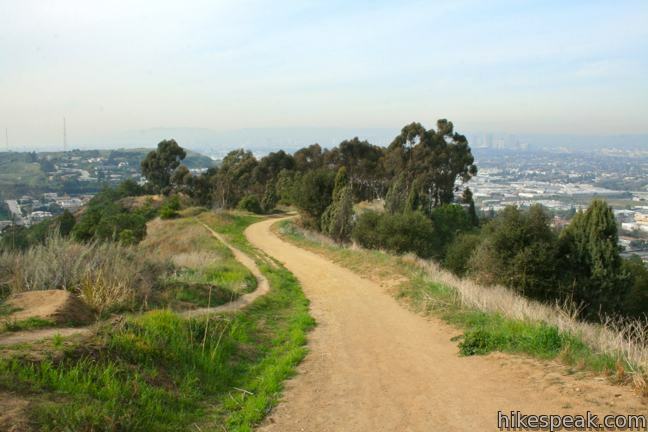 Can’t remember if the dirt switchbacks from the Bowl Loop to the outlook are too uneven. I’ve only been once. Thanks!